Police of ‘F’ Division are still investigating the circumstances, surrounding the death of a Moruca, Region One miner. 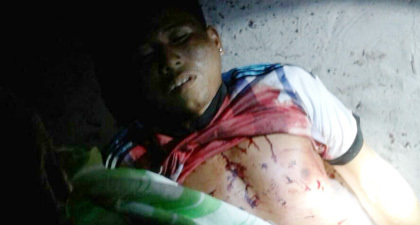 Dead is 25-year-old Rondee Peters, of Waramuri Mission, Moruca. According to information filtered to this publication, Rondee was stabbed some time around 00:30hrs yesterday morning. Kaieteur News was made to understand that prior to his death, Peters was having a drink with five of his associates. It has not been confirmed whether or not the men had a disagreement, though some neighbours are claiming they heard an argument echoing from the community ground. Sister of the deceased, Malindra Peters, said that she was made aware of her brother’s death sometime around 01:00 hrs yesterday morning. “By the time we reach at the ball field where the thing happen, we saw me brother tek he last breath. We try to get he to the hospital but that was already late. We notice that he had four stab wounds to he left side chest, and one in he back. The five men were allegedly arrested and taken to a nearby police station. Kaieteur understands that no murder weapon was found on the scene of the crime.